It's time to make Alfred Hitchcock cool again. 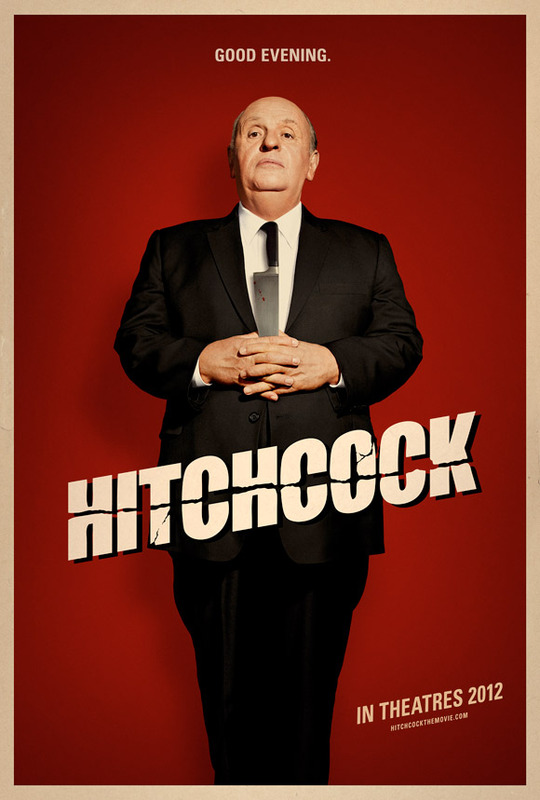 Fox Searchlight has announced a release date and debuted a teaser poster for their Hitchcock movie titled, aptly, Hitchcock, directed by Sacha Gervasi. This one is the one that stars Anthony Hopkins as the legendary filmmaker, Mr. Alfred Hitchcock, and we got a first look at him back in April. The release date they've set is November 23rd, 2012, which means they may be priming this for an Oscar push. Now it's time to get a formal introduction with this stark red teaser poster to mark the occasion. This is a delightful follow-up to HBO's The Girl, which also has Toby Jones as Hitchcock. Here's the teaser poster debuted with the news of a November opening. Looking forward to the trailer next! Sacha Gervasi (Anvil! The Story of Anvil) is directing Hitchcock, written by John McLaughlin (Black Swan) and based on the book Alfred Hitchcock and the Making of Psycho by Stephen Rebello. Anthony Hopkins plays director Alfred Hitchcock and is supported by a great cast including Helen Mirren, Scarlett Johansson, Danny Huston, Toni Collette, Jessica Biel, Michael Stuhlbarg, James D'Arcy and more. The film, a love story, takes place during the making of Hitchcock's seminal film Psycho. Fox Searchlight opens Hitchcock in limited theaters on November 23rd, Friday after Thanksgiving, the same week as Life of Pi, Red Dawn and People's Choice winner Silver Linings Playbook. Should be interesting. We'll watch out for the trailer. A silhouette may have been more effective as a teaser poster. But this is cool nonetheless. Yeah, they could have played it with the famous silhoutte being Anthony Hopkins shadow or something. That's a great poster. Can't wait to see it (and The Girl). Ha! I love the tie! Is this Hancock's white bro? Is this a sequel to Will Smith's Hancock without him? Someone chime me in on this!!?? It's a crossover between what is clearly the two greatest Will Smith properties- Hitch and Hancock. He tries to get people to meet each other... and there's a scene where he skyrockets a woman off of him post-coitus. Trust me, it'll sell. Don't you mean November 23rd, 2012? Yes, yes I do. Whoops - fixed. I guess I was so surprised they're releasing this one so quick! Yep, only two months away. While he might be the better actor, that other guy in that other Hitchcock film looks more like the actual Hitchcock. Ha, cute! Really great makeup job.